No monument better reveals just how potentially savage the unbridled force of Sekhmet could be in the eyes of the ancient Egyptian than the Karnak Temple Complex, specifically the Mut Precinct, in Thebes. There is still some disagreement among scholars about the actual location of the temple however, all scholars agree that the temple was located somewhere in Thebes and that the group contained some 730 individual statues of Sekhmet, some enthroned as here, others standing. The reason there were so many statutes of this goddess was due to Her power, which if left unchecked, could be unleashed to the detriment of Egypt and pharaoh himself. Estes, J. Worth "The Medical Skills of Ancient Egypt"
Ebeid, Nabil E."Egyptian Medicine In the Days of the Pharaohs"
Germond, Phillipe"Sekhmet Et la Protection du Monde"
Ghalioungui, Paul"The Physicians of Pharaonic Egypt"
Ghalioungui, Paul"Magic & Medical Science in Ancient Egypt"
Hoenes, Sigird-Eike"Untersuchungen Zu Wesen Und Kult Der Gottin Sachmet"
Nunn, John F."Ancient Egyptian Medicine"
Siuda, Tamara"The Neteru of Kemet: An Introduction"
Stetter, Cornelius"Secret Medicine of the Pharaohs"
Watterson, Barbara"The Gods of Ancient Egypt"
Her very Name means "She Who Is Powerful". Sekhmet personifies the aggressive aspects of the female forms of Netjer and acted as the consort to Ptah. However, it is believed that Sekhmet's worship pre-dates that of Ptah by at least several hundred years. Sekhmet is usually portrayed as a woman with the head of a lioness, but as the Daughter of the Netjer of the Sun, Ra. Sekhmet is closely linked to the Uraeus (Buto or Wadjyt) in Her role as the fire-breathing, 'Eye of Ra'. The pyramid texts themselves mention that the King or Pharaoh was conceived by Sekhmet, Herself. Sekhmet is one of the oldest known forms of Netjer in Egyptian history. She the 'patron' of the Physicians, Physician-Priests and Healers. Because She is one of the most powerful of all the Names of Netjer, (Her name literally translated means "Mighty One", or "Powerful One"). Her Name is derived from the Egyptian word 'Sekhem', which means "power" or "might". The word sekhem' is literally inseperable from Sekhmet and Her worship. Because of these facts, She is often times misunderstood and portrayed only in a negative way This is probably because of legends of how Sekhmet, as the destructive Eye of Ra was sent forth to punish humanity for its mockery of Her Father, Ra. The myth of Sekhmet's Creation explains how Sekhmet came into being from Het-Hert (Hathor). But in spite of the fact that She is sometimes 'destructive', Her qualities as Healer, Mother and Protector are often overlooked. In the realm of Ancient Egyptian Medicine, almost all healers and surgeons of Ancient Kemet would most certainly have fallen under Sekhmet's jurisdiction. Sekhmet was worshiped throughout Egypt, particularly wherever a wadi opened out at the desert edges. This is the type of terrain that lions are often found. Many of them having come from the desert in order to drink and to prey upon cattle in the area. It is said that Her worship was possibly introduced into Egypt from the Sudan, because lions are more plentiful there. Sekhmet's main cult center was located in Memphis (Men-nefer)and was part of the Divine Triad there, which was made up of Ptah, Sekhmet and Nefertum. Sekhmet is the wife of Ptah, the 'Creator' Netjer of the Ancient Egyptians and their son is called Nefertum, who is also closely associated with healers and healing. 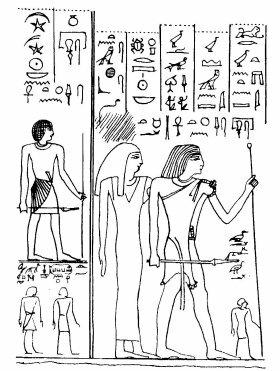 Because of the shift in power from Memphis to Thebes during the New Kingdom (1550- 1069 BC) the Theban Triad, made up of Amun, Mut (Amaunet), and Khons, Sekhmet's attributes were absorbed into that of Mut. This meant that Sekhmet was increasingly represented as an aggressive manifestation of Mut and the Two Goddesses, along with HetHert and Bast were often synchretized. Mut-Sekhmet was the protectoress, Wife of the King of the Gods, Who also was incarnate through the person of the Pharaoh. Within the Mut Precinct were found large numbers of statues of the lioness-goddess which wereerected by Amenhotep III (1390 - 1352 BC) both in the Temple of Mut at Karnak and also at his mortuary temple which was located in Western Thebes. Sekhmet's action is always the right, or 'appropriate action'. When She destroys it is an appropriate destruction or vengence. It is never chaotic or random. It is always what is needed at the time. Even though Sekhmet is not intimately linked with the aspect of destruction, as Netjer Set is, She removes threats and punishes those who do wrong against Ma'at.